Lime Essential Oil (Citrus Latifolia Tanaka) - Sweetgrass&Rain Inc.
Lime is a small evergreen tree that produces a small, sour fruit very similar to Lemon. The fruits themselves are green in color with a fleshy interior. Historically, limes were used to prevent sailors from developing scurvy. Lime Essential Oil has a crisp, refreshing citrus scent that has been used in aromatherapy for its uplifting and revitalizing properties. It can also act as an astringent on skin where it is reputed to help clear oily skin. 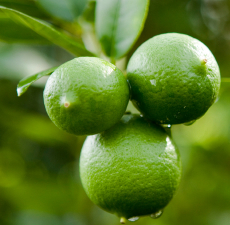 Lime Essential Oil has a crisp, fresh citrus aroma that is sweeter than the fruit.